An army officer has been arrested over the murder of journalist Lasantha Wickremetunga, the police said. The officer, identified as P. Udalagama, is attached to the army intelligence unit, the police added. 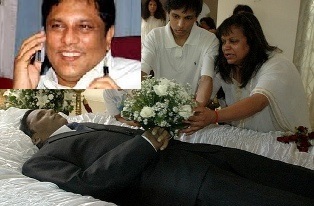 Lasantha Wickrematunge, the Chief Editor of the popular English weekly The Sunday Leader, was assassinated on 8 January 2009 by four assailants who stopped him on his way to his office on Attidiya-Mt. Lavinia road. In May this year Army Commander Lieutenant General Crishantha de Silva was ordered by court to submit army intelligence reports related to the murder of Wickremetunga, to the CID. In an editorial written shortly before his death, and that was published posthumously, Wickrematunge accused former President Mahinda Rajapaksa’s Government of intending to silence him and voiced his commitment for press freedom at the risk of his life.